February 2, 2017 by iCepts Technology Group, Inc.
Microsoft Dynamics 365 is the next generation of cloud business applications that can give you the power to meet the changing needs of your customers, accelerate digital transformation and change the way you do business. 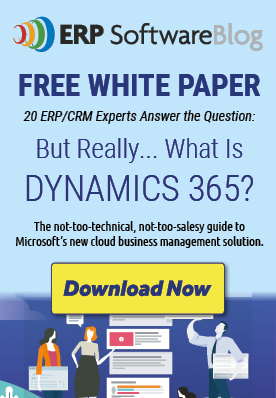 Microsoft Dynamics 365 unifies traditional customer relationship management (CRM) and enterprise resource planning (ERP) capabilities into new purpose-built business applications to help you capture this opportunity. Microsoft Dynamics 365 for Financials is the primary Module in the Business Edition of this system. Dynamics 365 is a business management solution that’s connecting people and processes like never before. From day one, it makes ordering, selling, invoicing, and reporting easier and faster. Automatically pull systems and processes together to manage financials, sales, service, and operations, Connect with 3rd party applications like payroll, banking, CRM, or industry -specific systems. With Dynamics 365 for Financials you can access live financial data directly from Microsoft Excel to read, write and update items, sales orders and purchase items. In addition, professional looking customizable quotes, and invoices can be created right from Word. Also, workflows are available to streamline business processes by synchronizing files, route documents and compose recurrent reports. Importantly, Dynamics 365 ensures compliance with audit trails and enterprise level security. Centralize data from accounting, sales, purchasing, and inventory to get an accurate view of your business. Real-time data updates help you spot trends, prevent issues, and deliver great customer experiences. With Dynamics 365 for Financials you can perform ad hoc, customized reporting by analyzing data across multiple dimensions, create custom dashboards for real-time analysis using Microsoft Power BI. Handle business processes like quotes, orders, invoicing, purchasing, cash management, and reporting, from day one Built in the cloud, Dynamics 365 for Financials is easy to set up and manage. Drive quicker adoption and reduce training time with the same easy-to-use interface as the Office tools you already know-Dynamics 365 looks and feels like Office. Furthermore, user accessibility, including mobile technology, makes it easy to get to the information you want, where you want from your desktop, laptop, tablet, or phone. With all of these options, you get the same powerful capabilities and rich functionality and get one experience that’s consistent and secure across Windows, iOS, and Android.